This entry was posted in Learning thoughts on October 22, 2005 by Stephen Powell. Wow, that’s quite a collection you have there. Tell me, what was the learning opportunity? Where is the analysis and what conclusions did you draw? Seriously though, hope you had some good fun and washed your hands afterwards…. I wonder why you picked them rather than photographing them without disturbing them if you weren’t going to eat any of them? It looks like there’s a yellow boletus (bolet jaune) and not much else of culinary value. Roger Phillips is probably the best reference but please don’t just collect indiscriminately as depleting the mycological diversity is bad for the overal woodland ecology. Hi Linda and Andy, picked to take home, identify, and draw. Not by me, but the folk that I went with. Of course we were selective in our collecting as you can see from the picture we didn’t pick buckets full! The outing was inspired by the North Wales Wildlife Trust – see the details below. 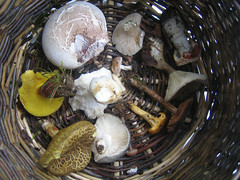 “Fungus Foray (Bring lunch & container for fungi). Search for fungi in lovely woodland and mereside setting. (Kind permission from Mr & Mrs Keith Jones). Leader: DR Bruce Ing, International Mycologist. Identification and display facilities – bring along any other fungi specimens.